Biogas is an important energy source that plays a central role in the energy revolution. Unlike wind or solar energy, biogas can be produced around the clock. Could it soon perhaps even be produced to meet demand? 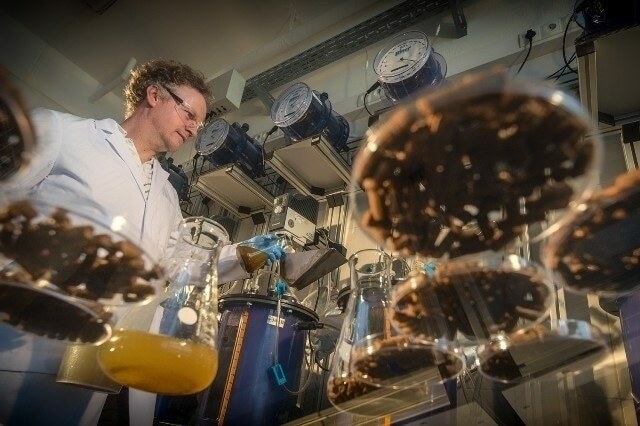 A team of international scientists, including microbiologists from the Helmholtz Centre for Environmental Research (UFZ), scientists from Aarhus University and process engineers from the Deutsches Biomasseforschungszentrum (DBFZ), have been studying the feasibility of this kind of flexible biogas production. Among their findings, for example, is the discovery that biogas production can be controlled by altering the frequency at which the reactors are fed. If the intervals are longer, more biogas is produced, according to the researchers' paper in the Applied and Environmental Microbiology journal. Biogas production has long been a valuable technology, as the constant feed of organic raw materials such as energy crops, manure, sewage sludge, catch crops and plant residues helps produce energy around the clock. The ability to produce energy at a constant rate is a clear advantage over other renewable energy sources such as wind or solar energy, which depend on the wind or sun for production. As a result of this ability, Germany currently has around 8,000 biogas plants installed, with a total electricity output of approximately 4,500 megawatts. Around seven percent of the electricity generated in Germany now comes from biomass. It is hoped that even more electricity will be produced from this source in the future. Scientists from the UFZ, the University of Aarhus (Denmark) and the DBFZ succeeded in increasing the production of methane, the most valuable component of biogas, by up to 14 percent under laboratory conditions when the scientists added the substrate to the fermentation tank at intervals of between one and two days compared to the conventional interval of every two hours feeding. The results were astonishing: "Feeding the reactor less often results in greater energy yield", summarised Dr Marcell Nikolausz, UFZ researcher at the Department of Environmental Microbiology and corresponding author of the study. The researchers fed two 15-litre reactors with distiller's dried grains with solubles (DDGS) under identical conditions for a total period of almost four months. DDGS is a by-product of bioethanol production using starchy grains. The researchers fed one reactor with DDGS every two hours. The other reactor was fed with the entire quantity once per day, in one experiment, and once every other day in a second experiment. The results were surprising. If the full quantity of biomass was fed into the fermentation tank just once a day, 14 percent more methane and 16 percent more total biogas is produced. If the tank was fed every two days, methane yield increased by 13 percent and biogas yield increased by 18 percent. One explanation for this could be that the greater variations in environmental conditions, particularly the fluctuating substrate concentration, increased the diversity of the microbial community, leading to more functional groups of bacteria. "This gives the micro-organisms more ways to degrade the substrate more efficiently", said microbiologist Nikolausz. He explained that this accelerates production and provides the micro-organisms with better conditions in which to process the biomass more efficiently, especially the components that are difficult to degrade. This flexible feeding management approach has no negative effect on the stability of the biogas production process. The researchers proved this by using T-RFLP profiles of the micro-organisms. This method can be used to verify the genetic fingerprint of the community of bacteria and methanogenic archaea that convert the organic material to biogas in the reactor. In case of the bacteria that convert the complex components of the biomass, such as cellulose, starch, lipids and proteins, into carbon dioxide, hydrogen and acetic acids, in several stages, the composition of these bacterial communities varies in the different feeding regimes. This is because the concentrations of ammonium nitrogen and hydrogen vary, as does the pH value. "The environment in the reactor is more dynamic when it is fed daily or every other day. This creates more functional niches, benefiting certain hydrolysing and acid-producing bacteria", said Nikolausz. In contrast, the community of methanogenic archaea, which in the final stage produce methane, water and carbon dioxide, remained stable. Regardless of how often the reactor was fed with biomass, the Methanosarcina genus, with a relative proportion of up to 83 percent of all methanogens, was consistently dominant followed by the genus Methanobacterium, which constituted up to 31 percent of all methanogens. "Both genera appear to adapt well to the changing conditions", Nikolausz explained. Research into flexible biogas production by employing feeding management is still in its infancy. The UFZ researchers plan to delve deeper into the results of the study. According to Nikolausz, the research results now need to be confirmed by trials in larger reactors. The use of other substrates is also an interesting subject. "We are keen to see whether we can also confirm that higher quantities of methane are produced when corn silage or sugar beets are used", said Nikolausz.